Leverage the efficiency and security of mother nature in your next generation data center. Nestled in the tree-lined bluffs overlooking the Mississippi River and strategically located in the St. Louis metropolitan area, GridRock’s unique site offers significant natural and commercial benefits for a next generation, sustainable, hyper-secure data center. Strategically located in the Midwest US, within 300 miles of 10 major cities. Naturally safe & secure underground structure saves time and money. Multiple carrier options for your diverse needs. Ultra-fast fiber network. Uniquely safe and secure, due to being underground. Guarded 24/7. Renewable energy for green data center needs, including solar and wind power. With 5 million square feet of available space, GridRock Data Center is ready to handle a diverse range of data center requirements. Using the natural power of nature. Realize significant strategic advantages moving your data center underground with GridRock Data Center. Not only do we save space, we make it more affordable. Our dedicated storage center is looking forward to hosting your data in our naturally protected facility. GridRock can keep your data safe, secure, fast, and at a lower cost than traditional above-ground data centers. 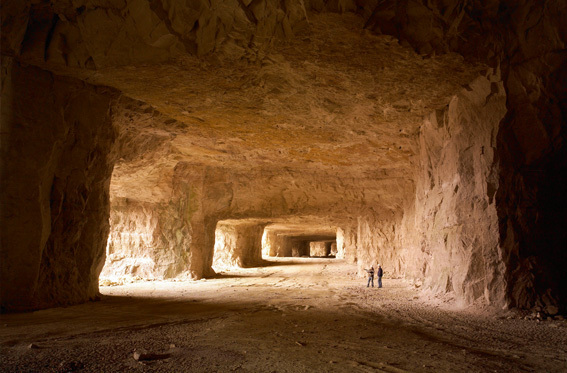 Centrally located and sustainable, our facility minimalizes resource consumption and maximizes efficiency in Rock City's limestone mine. 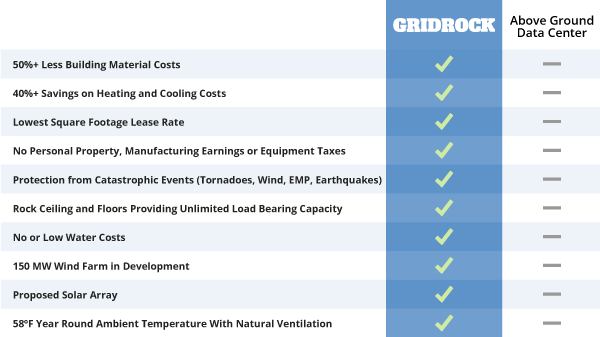 GridRock Data Center powers your data using natural and traditional power, lowering costs and the impact to the environment. Due to the unique structure of the GridRock facility, we are able to offer our clients the lowest square footage lease rate available. GridRock's cool natural temperature and structural integrity make it efficient by nature. Get GridRock News and updates straight from our blog! © 2019 Web Design and Company LLC. Used by GridRock under license.